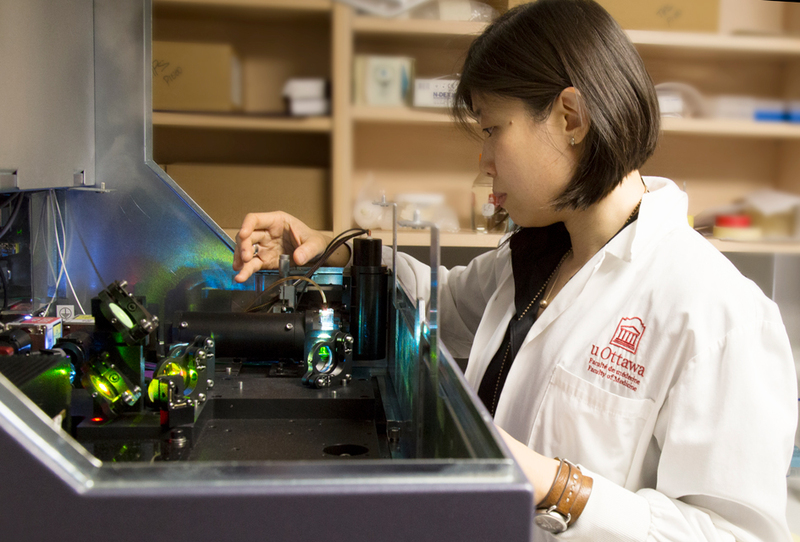 Dr. Vera Tang* proudly shows off her lab’s flow cytometer, the birthplace of a new technology expected to lead to a new generation of cheaper and faster diagnostics of health disorders. Flow cytometry is routinely used to diagnose health disorders by analyzing cells found in blood, tissues and organs. “Until now, the process was limited to analyzing cells and particles over a certain size,” says Dr. Tang, a research associate, who with PhD student Tyler Renner and two others make up Dr. Marc-André Langlois’ team at the Faculty of Medicine’s Department of Biochemistry, Microbiology and Immunology. The group has developed a technology called nanoscale flow cytometry allowing for the analysis of extracellular vesicles, exosomes and viruses using flow cytometry. Their revolutionary work was published recently in Nature Scientific Reports. The team has developed new protocols and a nano-size standard based on an inactivated fluorescent viral particle, to act as an accurate and reliable tool to calibrate flow cytometers that are specially modified for small particle analyses. No such standard is currently available on the market. In addition to its uses in the diagnosis of disease, flow cytometry has many other applications in basic research, clinical practice and clinical trials. Read the paper in Nature Scientific Reports. *Dr. Vera Tang, Flow Cytometry core manager and the Faculty’s local flow cytometry expert, was recently awarded high-level recognition from the International Society for Advancement of Cytometry (ISAC) in being selected as a Shared Resource Lab Emerging Leader. Applicants, which included flow core managers from around the world, were required to demonstrate excellence in research, training/teaching and service in the field of flow cytometry. Dr. Tang’s important research in development of nanoscale flow cytometry, as well as her course teachings in flow cytometry and her leadership with training and project design to users of the Flow Cytometry core, were all contributors to her successful application. ISAC’s members establish the international standards for flow cytometry. This prestigious recognition of Dr. Tang has put the Faculty on the map as an elite flow cytometry institution. Congratulations! With support from affiliated hospital-based research institutes and the University of Ottawa, the Faculty has successfully developed a series of cutting-edge core facilities that bring together state-of-the-art equipment, instrumentation, methodologies and expertise crucial to the success of basic and clinical research activities. These facilities are accessible to all researchers across the University of Ottawa as well as to outside communities on a fee-for-service basis. To date, 13 cores have been established and a few others are in the planning stages. For each facility, a director and user committees have been appointed to ensure accountability and optimal use for the continued commitment and success of our expanding core facilities. For more information, please visit Core Facilities website. New technology in flow cytometry developed by Dr. Vera Tang (pictured) and the rest of Dr. Marc-André Langlois’ team could mean faster and cheaper diagnostics.